Hello my FAITH-ful readers! I hope you’ve had a great week! Greetings from Miami! I am with the maCares team spreading awareness at a big conference. We want to share some ‘paw-some’ news that will make you jump for joy! To help even more veterans, children, and adults with service dogs, maCares now offers an additional level within the maCares & faith Cares Service Dog Support Program! This new level allows service dog teams that are not within driving distance to the maCares location to receive financial support for the care of their fully trained service dog. Please put your paws together to welcome the first sponsored team to be welcomed into the new Flexible Level of the maCares & faith Cares Service Dog Support Program, Manny and TANK!! Manny and TANK teamed up in 2012 to work together to diffuse symptoms of Post-Traumatic Stress Disorder and a seizure disorder. Manny served in the United States Marine Corp for 10 years in a range of positions including Embark Logistics, Hazmat, Ground Safety, and Marine Air-Ground Task Force Planner (MAGTFP). During his tour, he was involved with Operation Iraqi Freedom (OIF) as Field Military Police. 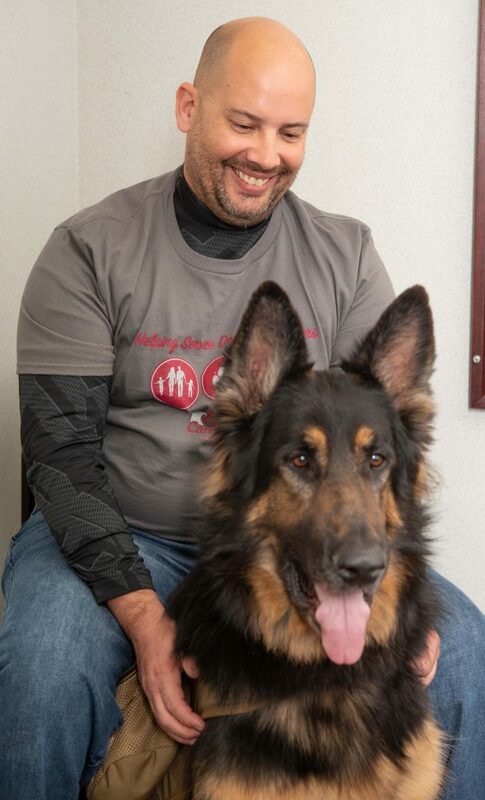 TANK provides Manny the security to live a full life, safely, while experiencing seizures. TANK alerts Manny, as well as Manny’s wife, when a seizure is about to happen so Manny can get to a safe area and roll to his side, keeping him alive. TANK also helps lower anxiety and stress levels, interrupts nightmares, and assists with stability. Manny and TANK do everything together. Without TANK, Manny says he would be lost. The pack and our 2-legged friends are so excited that Manny & TANK have joined the maCares family! Please help us celebrate and support them! To learn more about the service dog teams you are helping when you support maCares, check out all the maCares & faith Cares sponsored service dog teams by clicking here. Stay up-to-date on the events maCares holds to raise money to stay committed to ‘Helping Service Dogs Help Others’ by following us on Facebook and checking our website postings and online calendar. Other ways you can help support teams like Manny and TANK are purchase maCares branded items like shirts, OPERATION UNIFORM wristlets and crossbody bags, branded backpacks, and more! If you would like to, please contact weCare@maCares.org with your order details. maCares would not be able to make a difference in the lives of others without your continued support. Together we are helping to make a difference in the lives of others.